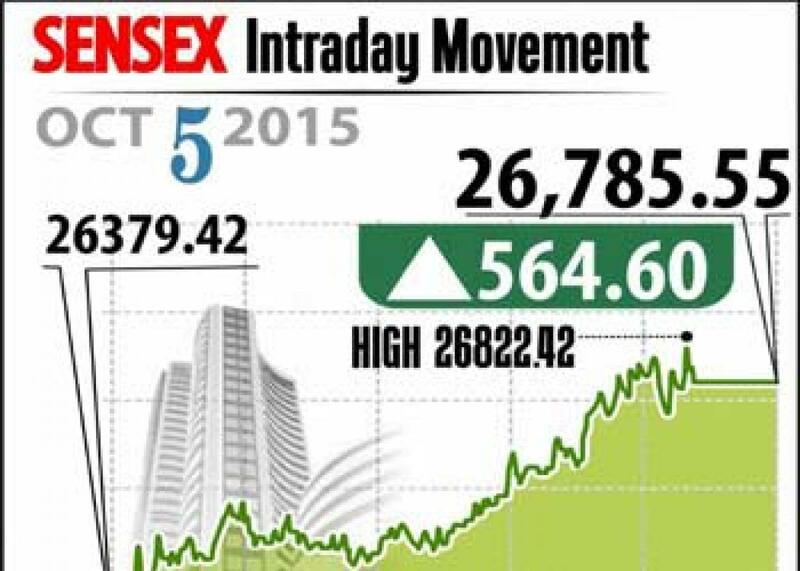 Markets zoom on global cues. Indian stock markets zoomed for the fourth consecutive day on Monday, driven by positive vibes from global markets including Asian and European bourses. Mumbai: Indian stock markets zoomed for the fourth consecutive day on Monday, driven by positive vibes from global markets including Asian and European bourses. The investors were in upbeat mood as weak US jobs data raised hopes that the US Federal Reserve might further delay the much-awaited rate hike. The benchmark BSE Sensex rallied 564 points, or 2.15 per cent during the day to end at 26,785 while the 50-stock NSE Nifty rose by 168.4 points, or 2.12 per cent, to close at 8,119.30. Both the indices ended at one month high. The upswing on Monday followed a rally witnessed in the past three sessions after the Reserve Bank of India (RBI) surprised the markets with a rate cut of 50 basis points last week. The broader market indicators followed the benchmark indices in posting high gains. The BSE midcap index ended 1.79 per cent higher while the BSE smallcap index rose by 1.69 per cent. Among the sectoral indices, the BSE Capital Gooods index remained the top gainer. The fact that 25 out of the 30 Sensex stocks closed in the black went on to indicate the broader positive sentiment in the markets. European markets witnessed gains in the early trade with German DAX surging by 2.15 per cent while the French CAC40 post 3 per cent upswing. The FTSE100 index was trading 2 per cent higher while the Euro Stoxx 50 index rose 3 per cent. Among the Asian bourses, Japan's Nikkei was up 1.8 per cent while South Korea's Kospi closed 0.44 per cent higher. Hong Kong's Hang Seng index rose 1.6 per cent while South Korea's Kospi ended 0.44 per cent higher.